Jean-Philippe RAMEAU: Pièces de Clavecin en Concerts (1741). Ensemble Masques: Olivier Fortin (hpsi), Anne Thivierge (fl), Sophie Gent (vln), Mélisande Corriveau (viol). Atma Classique ACD2 2624 (http://www.atmaclassique.com/). Distributed in the US by Naxos (http://www.naxos.com/). “Concerts mis en simphonie.” Jean-Philippe RAMEAU: Pièces de Clavecin en Concerts (1741, arr. 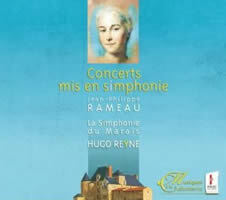 Hugo Reyne); La Gavotte et ses 6 doubles (1728, arr. Reyne). La Simphonie du Marais, Hugo Reyne (cond.). Musiques à la Chabotterie 605006 (http://www.simphonie-du-marais.org/simphonie/discographie/label-musiques-a-la-chabotterie/). Distributed in the US by Allegro Music (http://www.allegro-music.com/). Nearly 270 years after its first publication, Rameau’s Pièces de Clavecin en Concerts perpetuate a modest enigma: What sort of ensemble should play them? Rameau’s ambiguous instructions are troubling: “Harpsichord pieces in concert with a violin or a flute, a viol or a second violin.” Such flexibility was common in Rameau’s day, when players could capably adapt or when publishers wished to cast a wide net. This attitude does not sit well with today’s early-music mindset which prefers to seek an ultimate interpretation without permitting pluralities. The 1741 publication is in full score. Unlike a trio sonata where a flute or violin is supported by a figured-bass, the Pièces de Clavecin en Concerts’ parts are completely written out. The harpsichord labors constantly, and the other two voices sometimes double it, though they might present substantially different material or step aside. This can create balance problems: The keyboard’s plucks must lead and be audible, yet the other customarily louder instruments must also be distinct. Among available recordings, a trio formation appears to be fairly common, the harpsichord joining with violin and viola da gamba. Some ensembles introduce flute or slip in a second violin. Perhaps indicating the Pièces de Clavecin en Concerts’ 18th-century popularity, a later hand published a six-part orchestration. My fondness for the Pièces is such that I will gladly hear any offered configuration. Among trios, I have enjoyed Sonnerie (Mitzi Meyerson, hpsi; Monica Huggett, vln; Sarah Cunningham, viola da gamba) on Virgin 7243 5 61872 2 1. Baroque Nouveau (Charles Sherman, hpsi; Anthony Martin, vln; Stephen Schultz, bar fl; Josh Lee, viola da gamba) on Reference Recordings RR-118, with flute, improves upon Sonnerie’s balance. For the Six Concerts en sextuor, Rousset’s rendition (with Les Talens Lyriques on Decca B0001845-02) remains a favorite despite its awkward zeal. Ensemble Masques coalesce around the basic trio. Their modest rendition infrequently incorporates flute. A crisp violin ensures that the harpsichord remains dominant, though the resulting shifts in balance may perplex newcomers expecting a headlining soloist. The group easily enriches the flow with subtle ornamentation and adjustments in pacing. These tasteful liberties are most noticeable in the last page of the Quatrième Concert’s La Pantomime. La Simphonie du Marais proposes the Pièces de Clavecin en Concerts scored for the orchestra Rameau may have enjoyed at his patron Alexandre-Jean-Joseph Le Riche de La Poplinière’s chateau. Despite the forces (five violins, one viola, two cellos, bass, two flutes, oboe and bassoon) these are delicately constructed arrangements, tending towards dryness. A spoken introduction provides each movement with its title, reminding us of the work’s inscrutability. 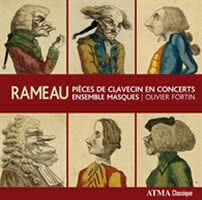 Distance obscures Rameau’s intentions: These concerts collect character pieces, most named after real people, though they don’t seem to be caricatures or overly descriptive. We may never know what precisely is Rameauesque about La Rameau or Forquerian about La Forqueray. The disc concludes with an orchestration of the Gavotte and Doubles from the A minor Suite, quite different in force from Klemperer’s orchestration. “Ugab No. 1: Cintegabelle.” Jean-Philippe RAMEAU: Var. comps (arr. Rechsteiner). Yves Rechsteiner (org), Henri-Charles Caget (perc). Alpha 650 (1 SACD) (http://www.outhere-music.com/alpha). Distributed in the US by Allegro Music (http://www.allegro-music.com/). Except for anecdotal evidence that he was hot-tempered, we know little about Rameau’s early career as an organist, and there’s no extant music for that instrument in his hand. Rechsteiner has published volumes of opera transcriptions, and Alpha presents 23 pieces as the first installment of a new organ series, named after the instrument’s Biblical ancestor. The SACD lives in an illustrated DVD-case-sized book with Rechsteiner’s detailed justification for why he has incorporated doubles, variations and ornaments into his arrangements. Multiple selections are abetted with a percussionist and suddenly we’re jousting at a Renaissance fair far from Versailles’ marbled courts. Several favorites put in an appearance: The Danse des Sauvages and Gavottes from Les Indes Galantes, the Rigaudon from Dardanus, etc. The historic organ at Cintegabelle has 34 modest but flavorful stops. “Les Musiques de Louis XIV du salon à l’église.” Var. comps. Var. artists. Naïve V 5196 (http://www.naive.fr/). Distributed in the US by Naxos (http://www.naxos.com/). “Les Musiques de Louis XIV du ballet à l’opéra.” Var. comps. Var. artists. Naïve V 5197 (http://www.naive.fr/). Distributed in the US by Naxos (http://www.naxos.com/). Were we to judge Louis XIV’s 72-year reign on the basis of Naïve’s two-disc sampler, it would appear that Charpentier must have been France’s most popular composer. Of course Charpentier’s bold Te Deum must introduce the “salon à l’église” disc, but that 19 of the combined 45 tracks are Marc-Antoine’s seems excessive. The église side of the aisle consists only of Charpentier, Sébastien de Brossard and an anonymous Antiphonaire des Invalides. Sharing the salon are Marin Marais, Robert de Visée and Charpentier again. The slight Marais viol-plus-lute items (Vittorio Ghielmi and Luca Pianca) and the de Visée theorbo pieces (Hopkinson Smith) are small delights. Couperin appears on the “ballet à l’opéra” release represented with extracts from Concert dans le goût théatral. 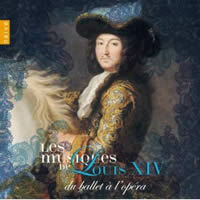 The disc opens with Lully’s Roland overture (Les Talens Lyriques under Rousset) and other operas include Lully’s Persée and Desmarest’s Vénus et Adonis. Musicians included span Naïve’s roster, including Ensemble Baroque de Limoges, Ensemble Amarillis, et al. I’ve nothing against Charpentier, but no Delalande? 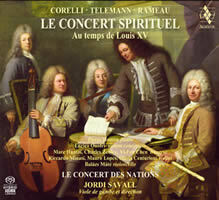 “Le Concert Spirituel – Au temps de Louis XV.” Arcangelo CORELLI: Concerto Grosso, Op. 6, No. 4 (ca. 1680, publ. 1714). Georg Philipp TELEMANN: Ouverture avec la suite en Ré majeur pour Viola da Gamba et Cordes (ca. 1720-40); Concerto in La minore per Flauto Dolce, Viola di Gamba, Corde e Fondamento (ca. 1720-40); Ouverture avec la suite en Mi mineur from Tafelmusik (1733). Jean-Philippe RAMEAU: Les Indes Galantes: Suites des Airs à Jouer (1735). Le Concert des Nations, Jordi Savall (cond.). AliaVox AVSA 9877 (1 SACD) (http://www.alia-vox.com/). Distributed in the US by Harmonia Mundi (http://www.harmoniamundi.com/). 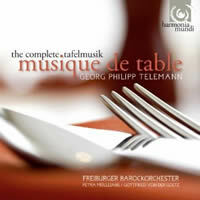 Georg Philipp TELEMANN: Complete Tafelmusik (1733). Freiburger Barockorchester, Petra Mülleians, Gottfried van der Goltz (dir.). Harmonia Mundi HMC 902042.45 (4 CDs) (http://www.harmoniamundi.com/). 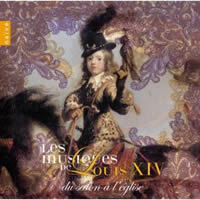 Le Concert Spirituel – Au temps de Louis XV confirms my affection for the French and Italian Baroque. Of course today’s national and period designations differ from those of 1715-74, during Louis XV’s reign. Considering this subset of all the music that may have appeared at Le Concert Spirituel (the first concert was in 1725), Corelli and Rameau’s vivacious passages and rhythms appeal more than Telemann’s solid harmonic patterning. Savall coaxes bright balance and Le Concert des Nations comprise some of the best players around. Might all these pieces have appeared on the same program? The detailed notes reveal Corelli appeared on concerts in 1725, 1748, 1750, 1764 and 1766, Telemann in 1738, 1745 and 1751, and Rameau between 1728 and 1768. 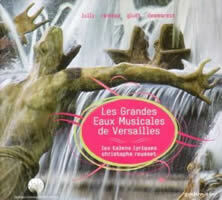 “Les Grandes Eaux Musicales de Versailles.” Var. comps. Les Talens Lyriques, Christophe Rousset (cond.). Naïve Ambroise AM 167 (http://www.naive.fr/). Distributed in the US by Naxos (http://www.naxos.com/). This sampler reaches into Decca’s archives to place three Rameau opera overtures among excerpts from productions Christophe Rousset and Les Talens Lyriques recorded for Naïve. Louis XVI’s entertainments are the unifying theme, but who wouldn’t welcome an excuse to respin Rameau’s Zaïs Ouverture? Voices appear around midpoint among extracts from Lully’s Persée and Roland. There’s also a storm from Gluck’s Bauci e Filemone and “Alto giove” from Porpora’s Polifemo. A dance suite is fashioned from Desmarest’s Vénus et Adonis. 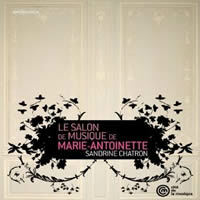 “Le Salon de Musique de Marie-Antoinette.” Var. comps. Sandrine Chatron (harp), with Isabelle Poulenard (sop), Jean-François Lombard (ten), Stéphanie Paulet (vln), Amélie Michel (fl). Naïve Ambroise AM 179 (http://www.naive.fr/). Distributed in the US by Naxos (http://www.naxos.com/). Sandrine Chatron plays a restored Érard single-action harp from 1799 in a program representing music that may have been heard in Marie-Antoinette’s salons circa 1770-92. The instrument is delicate and clear. After Petrini’s variations on La Folia, we launch into “J’ai perdu mon Eurydice” from Gluck’s Orphée. It was Gluck’s 1779 Iphigénie en Aulide which cemented Marie-Antoinette’s reputation as a formidable arts patron during Louis XVI’s reign. She also studied with Gluck. Chatron offers her “C’est mon ami.” The disc adds two vocal soloists, violin and flute in a varied program of songs and sonatas. Other pieces include premieres of a sonata for violin and harp by Jean-Baptiste Krumpholtz, text settings for soprano, tenor, violin and harp by Antoine Dauvergne, and a sonata for flute and harp by Joseph-Boulogne de Saint-Georges. Krumpholtz, a significant harpist in the 18th century, worked with Haydn at Esterházy. Purportedly he drowned himself in the Seine after his wife ran off with Jan Ladislav Dusik (or Dussek), represented here with a harp sonata. In addition to being a composer, conductor and fencer, Saint-Georges (also known as Chevalier de Saint-George) was one of the first European musicians of African heritage. He also conducted the premiere of Haydn’s Paris symphonies. Beyond the Gluck, the most familiar item here may be Mozart’s Adagio for glass harmonica, the arrangement for harp of which discloses the subtle creak of the Érard’s action.